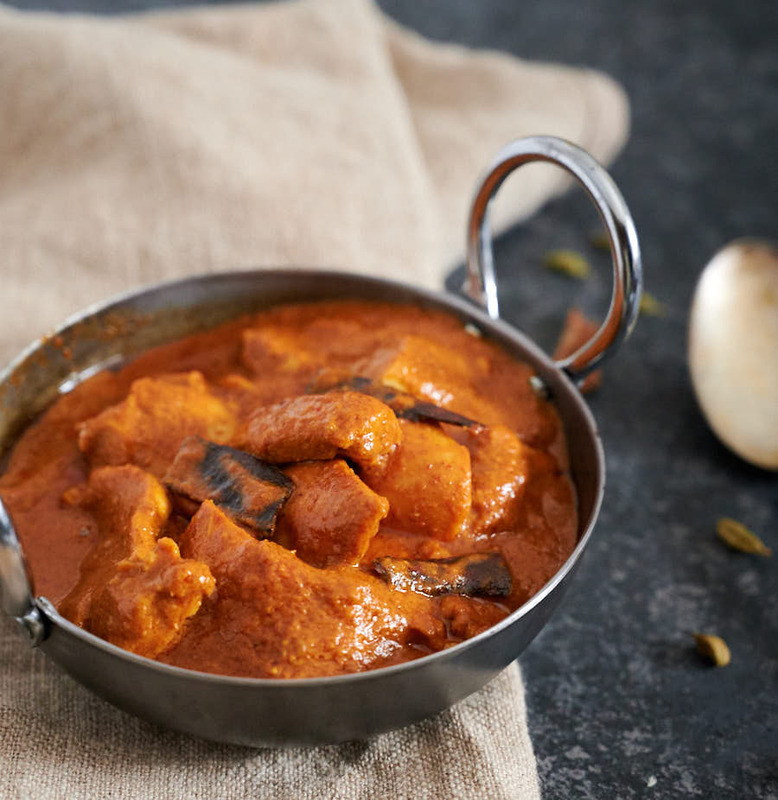 Shahi chicken korma is a rich and flavourful curry. It’s a dish invented for nobility. 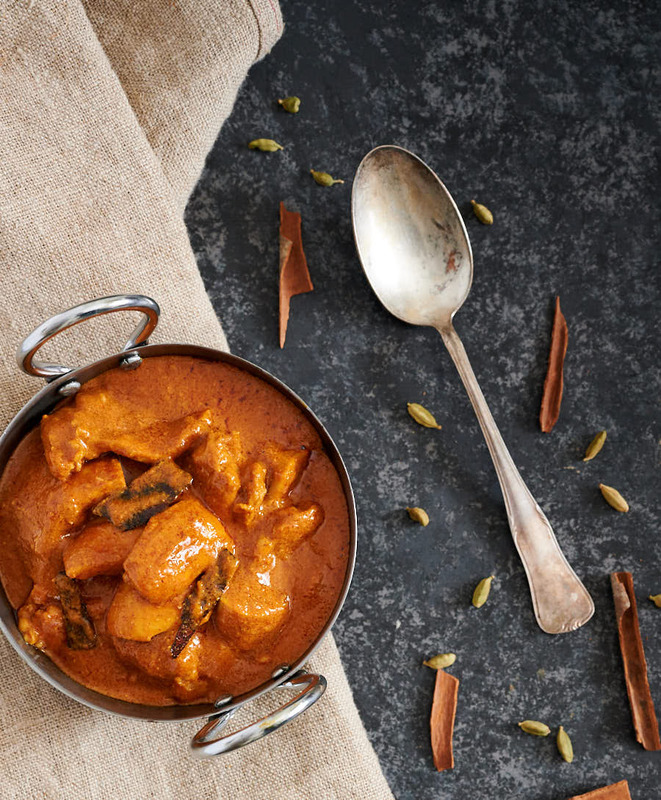 Spice, coconut, almond, cream and a hint of sugar come together in a sumptuous curry worthy of any celebration. 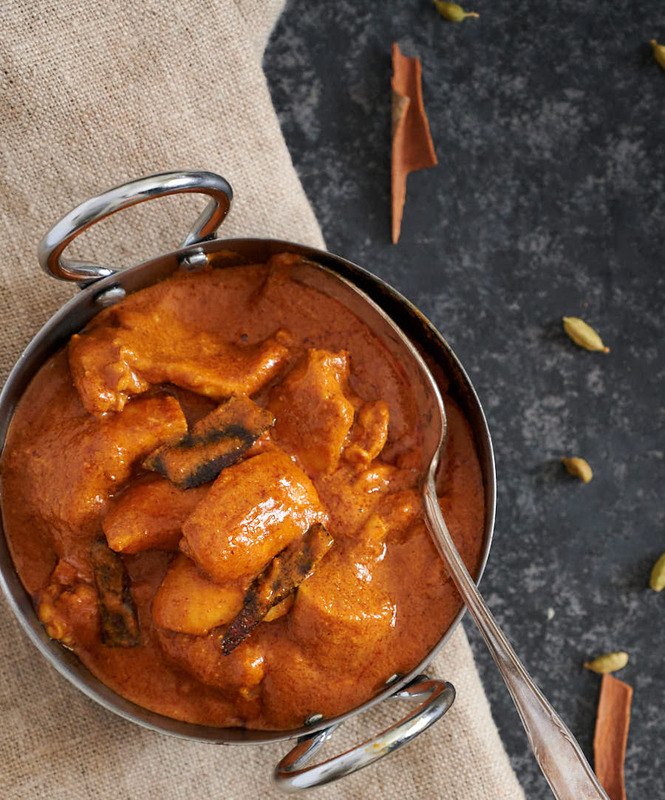 Chicken korma can be a great dish. If it’s done right. This is a dish that has been around forever. Traces back to the 16th century. Legend says it was served at the inauguration of the Taj Mahal. That’s a pretty big deal. Traditionally, it can run from mildly spiced to fiery hot. That’s right. Fiery hot. But something happened. Something I don’t think was good. Korma went from great to bland. Lost along the way. I’ve even seen recipes with bananas in it. Bananas??? This is royal food. Mughlai nobility to be precise. They weren’t chili heads. Ate pretty simply really. Imagine what they would think if they tasted the cloyingly sweet, flavourless versions served today. Not impressed I bet. Not at all. Korma used to be party food. Now it’s baby’s first curry. It doesn’t have to be that way. There’s no rule that says it needs to be bland. Or sweet. In fact the Mughlai version is well spiced. No sugar. But that version is a lot of work. Somewhere in the middle though. That is special. That’s what this shahi chicken korma is all about. Not a ton of work. Not bland. Real flavour. A bit spicy. Rich. Not so hard to make. If you’ve made any of the restaurant curries on this blog this one is no different really. Look at the pictures. This isn’t some yellow chicken korma loaded with sugar and cream. It’s red. If you are looking for creamy, bland and cloyingly sweet this isn’t it. Consider yourself warned. This is how they make curries in restaurants. It goes fast. Prep everything. Be ready. Have all your ingredients measured out before you turn on the heat. Restaurant style cooking is different from homestyle. It relies on high heat and curry base. This isn’t the slow braise you are used to. If you don’t know what I’m talking about read this primer to restaurant style cooking. There’s even a video. It will help. I could see this on a restaurant menu. Two versions. Chicken korma – curry for your kids. Shahi chicken korma – curry for you. Combine and mix the coconut milk powder and almond flour with enough water to form a thin paste. When the oil starts to shimmer add the cinnamon and cardamom and cook until they start to crackle. Now add garlic ginger paste and cook, stirring constantly, until it stops sputtering. Turn the heat up to medium high. This is also really important. The heat is what caramelizes the onion in the curry base and gives the curry it's Indian restaurant flavour. As you become more comfortable with this technique try pushing it. Add the rest of the curry base and let cook until the bubbles form. Stir in the coconut/almond paste. Turn the heat down to low and add the pre-cooked chicken. Add the sugar. Taste and decide if you want it sweeter. Creep up on it. You can add sugar. You cannot take it away. Add heavy cream to taste. None is a really good curry. 2 Tbsp is a creamy, kingly version. Decide what you are in the mood for. The cream does dull the flavours but it adds richness and tempers the heat. Garnish with a bit of chopped fresh saffron if desired and serve with rice or Indian flatbread. What a beautiful korma! This looks amazing! This looks incredible! Indian food is my go-to guilty take-out pleasure, but I always feel so much better about my healthy-ness and wallet status when I make food at home. And this chicken korma is right on the money. Give me all the spice… hold the fruit. Sounds perfect! Sounds like we think alike. This restaurant style korma isn’t exactly health food but it’s just the way I like it so I think it’s worth it! 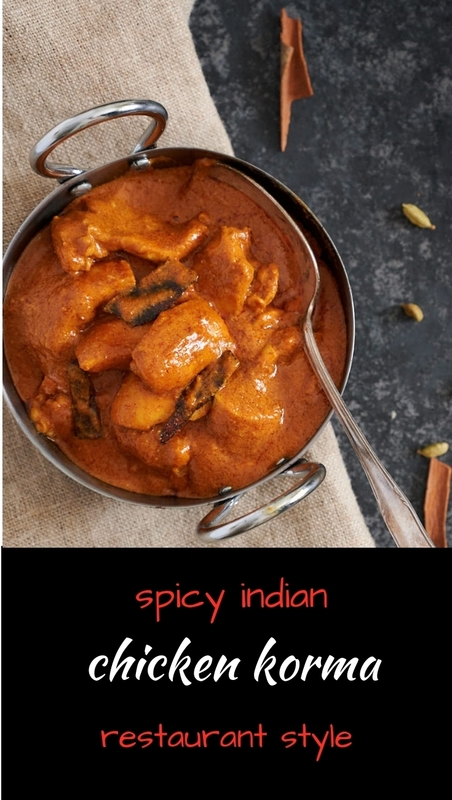 A little more spicy than the restaurant Korma, as you say. We loved it. A definite hit. Garry – that’s great to hear. I do like a little bit of kick in my Korma and I’m glad you do too. Hi. 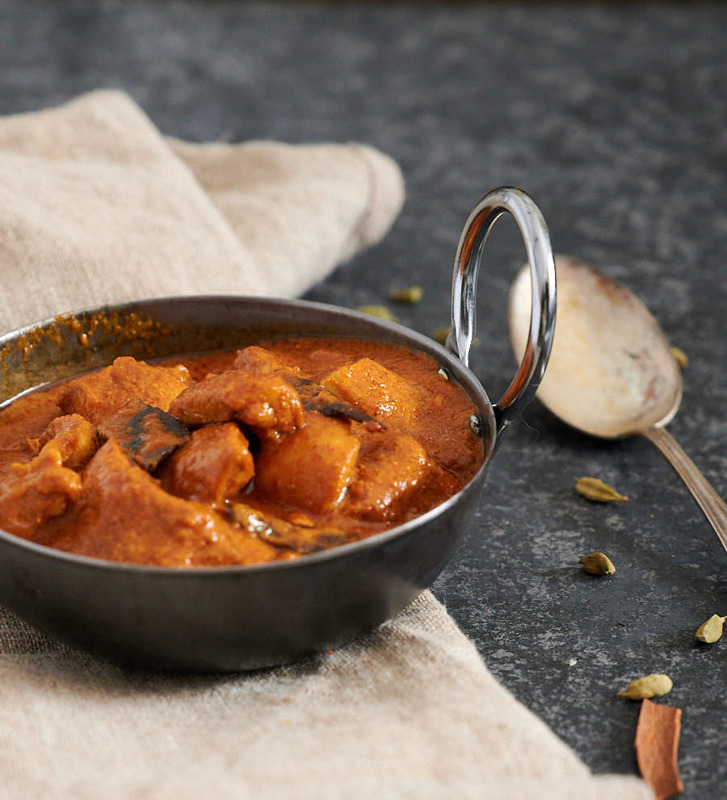 I want to make this Korma but don’t live near an Asian grocery store and here in England I can’t find the almond flour or coconut milk powder ,can I substitute with ground almonds and coconut milk or coconut cream? If so aprox how much please. You can certainly use coconut milk instead of coconut milk powder. I would go with 5-6 Tbsp and maybe taste it before adding the cream. Almond flour is not an Asian ingredient necessarily. I would think the baking section of a good grocery store would have it. Ground almonds might have a different texture. I’ve never tried. Maybe equal amounts ground almonds to almond flour?